The preservation of fruit by bottling or canning is a common way to manage large harvests and keep you in fruit throughout the winter months. The term ‘canning’ is an American alternative to the English ‘bottling’. Either description is an umbrella term to describe the preservation of fruit by turning it into chutney, relish, jam or jelly, or simply by pickling it. The pickling and preservation of fruit has been used for centuries to help people manage their harvests and provide an alternative to the winter staples of potatoes and greens. This method of preserving food is one of the oldest culinary skills of the human race, and it’s currently enjoying something of a revival. 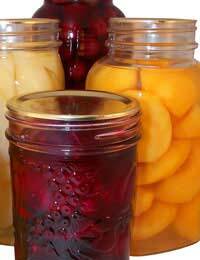 Almost any type of fruit can be bottled, although some types lend themselves to particular methods of preserving. Blueberries, raspberries, blackberries, currants and gooseberries all make excellent jams and jellies. Apples and pears make good chutneys and most fruits can be pickled. It’s a good idea to experiment with different types of bottling, however, so you can identify your favourite recipes. Fruit for bottling should be firm, young and never overripe. Wash and prepare the fruit, taking care to cut away bruised areas. Small fruits may be left whole, but larger fruits, especially ones with pips or stones, should be halved or quartered. Apricots and peaches should be peeled. Simply blanch the whole fruits in a saucepan of boiling water until the skin appears loose, then drain, leave to cool and the skin should fall off easily. Apples and pears should be peeled, cored and sliced. Fruit may be bottled cooked, raw or made into a puree, depending on the type and your preference. The 'raw-pack' method for bottling is best used for soft fruits such as, berries or plums, tomatoes, currants and cherries. This is where fruit is packed tightly into jars a third at a time, each layer being covered with a sugar syrup solution. Syrup helps preserve the colour and texture of the fruit and tastes good too. Fruit juice or wine can also be used with this method, spices such as mustard seeds, cloves, allspice, coriander seeds and black peppercorns can be added. Firm and fibrous fruits such as apples and pears should be cooked in a sugar syrup solution to make them easier to pack into jars. It also adds to the flavour and gives you the opportunity to infuse the fruit with spices. During simmering, to prevent the fruit from browning, rub peeled apples, peaches, pears, nectarines and apricots with lemon juice. Ensure jars are sterilised before you use them. This removes any bacteria present, which would cause your fruit to go off sooner than it would otherwise. Either wash the jars in your dishwasher just before you use them, or in hot, soapy water. Rinse them and stand them upside down in the oven at 150 C for 30 minutes. Your jars must be hot when you ladle in the mixture. Use a large, heavy non-metallic pan. Add sugar to the liquid over gentle heat and don't stir until it has all dissolved naturally. This prevents crystallisation and burning. When the mixture dries it can be prone to shrinking. Tap jars to remove any air bubbles. This will prevent oxygen being trapped in the jars, which can make them to go off. Once the mixture is in, seal the jars immediately. If you're using metallic lids, seal the jars with greaseproof paper and fix it with an elastic band. This prevents the acid in the mixture from coming into contact with the lid and corroding it. Store your preserves in a dark, dry, cool area. Moist, warm conditions can grow mould and thus spoil preserves. Light will bleach their colour. However you choose to bottle or can your fruit, you will have a tasty alternative to traditional ways of eating it, and be able to enjoy the fruits well into the winter months. Preparing the mixtures is great fun and the range of recipes available is endless. Last year I froze yellow plum compote but it took up too much space in small freezer. Can I bottle the compote (2kg plums, 25Og sugar, 1 1\2 orange) into jam jars . if so, what is the method, is the amount of sugar and orange above sufficient for safe preservation? We are glad this worked for you. Don't understand how one can "can" fruit unless one stores the preserves in cans! I think the author means non-reactive when stating that pots or pans be non metallic. Non reactive cookware does not "react" to acidic foods and can alter their taste. Stainless steel, enamel coated, glass and even plastic are considered non reactive (but don't try using the latter on a stovetop!) You can also use pots that are described as "hard anondized" like those made by Calphalon (just be sure to read the product description). When using the boiling water bath method, jars should be places in boiling water for 10 minutesprior to being used. This helps kill off bacteria and it keeps the jars warm in preparation for the addition of hot liquids like jams and sauces, so as to avoid breakage from putting hot liquids into a much cooler jar. Simply placing them in the oven does not sterilize them, it just keeps them warm. I'd take care putting glass jars in an extremely hot oven since they'd be surrounded by dry heat, which I think can lead to cracking and or breakage. If you're preserving your fruit in syrup, be it light, medium, or heavy, it needs to be HOT when it it put into the jars. (Even if the fruit itself is raw and at room temperature orslightly cool) Generally the jar is first filled with the desired fruit and then the hot syrup is ladled into the jars, leaving the piper amount of headspace and using a wooden skewer or plastic knife to remove any air bubbles that may be trapped inside the jar. Important side note, tomatoes are considered borderline acidic and need acidification prior to processing using bottled lemon juice, vinegar or acetic acid. This is true whether you're using bwb method or pressure canning. The thing to remember is that sterilizing jars, keeping the warm until you're ready to add hot liquids and processing them correctly are key. Adding hot contents to hot jars helps prevent breakage and overfilling (since some things expand more than others when hot) Processing in a boiling water bath ensures that the contents of the jar reach and maintain a certain temperature to kill off any other bacteria that may have come in contact with the contents. It's important to note that processing time only begins when the pot is at a full rolling boil, with 1 to 2 inches of water above the level of the jars. These conditions must be maintain constantly or processing time should start all over again. The boiling waterbath step itself serves two purposes. It allows for the creating of a stronger, more secure vacuum seal, but more importantly it kills off any harmful bacteria or mold spores that may have come in contact with the contents during preparation and transfer. Pressure canning is required for low acid foods but it can be used on high acid things as well. Pressure canning creates a much much hotter environment than a boiling waterbath can and thusly is capable of killing off a wider array of harmful bacteria and or mold spores. I, too, wish to know what a NON-METALLIC pan looks like. Hi! I need help. I need to preserve this lemon for "life", I want to use it as a display on the table top. I bought this huge lemon in Sorrento, and it is big as more or less 10 regular lemons combined. I saw the alcohol canning method. I don't mind if its in a jar, as long as it can be seen as it is. Please help me preserve this lemon. I agree what is a non metallic pan??? Hi, I don't think the bottling instructions shown above are detailed enough and I'm not surprised that some have failed. The best book I have is a MAFF of Home Preservation of Fruit and Vegetables, but it is very old and probably out of print now. 1.The bottles must be clean and sterilised and hot when you fill them. Ditto lids.The bottles can either come fresh out of a dishwasher, be washed and sterilised with boiling water and then rinses and/or placed in an oven for at least 20 minutes.I keep the lids in a pan of simmering water. 2.The fruit has to be cooked by one method or another.So you either simmer the fruit first, put into the sterilised jars and then put the lid on OR put the fruit into the hot jar, fill with simmering liquid and then place in an over to process the fruit for the recommended time. You need to get a book with all the different methods and timings.Only bottle fruit and tomatoes, not vegetables. Bottling has advantages over freezing as the fruit usually tastes better and it is like opening a can of fruit - instantly available.Also bottling apple puree is convenient if you have a glut of apples and no room in the freezer and don't want to make loads of jam. There is a glut of bilberries where I live.Having read your article on bottling, I have decided to have a go.Probllem is I don't know the recipe (quantity) for sugar syrup solution.Your help would be appreciated. Best regrards. Looking at your ideas on bottling fruit, drying and preserving it, tried to print it to use and have a go but it wont print how can I get the recipes and tips? or am I doing something wrong! I have just opened a bottle of figs that I bottled nearly 3 years ago and some of the liquid is more like jelly. What could have caused this and is it safe to eat? I am looking for a recipe to bottle gooseberries.I am living on a farm and have so many gooseberries and it is going to waste.I have cooked jams and jellies but I would very much like to bottle them - like canned fruit. Can anyone help please? What on earth do you mean by a non-metallic pan? Hi, I bottled pears last summer, followed the above advice, and some pears in some bottles have turned black? Does anyone know why?